Good evening everyone! Hope everyone had a wonderful weekend. Tonight I have another great shop from Etsy that is full of beautiful polish. Shimmer has tons of different blends and all are very unique. The polish sold by Shimmer are total glitter bombs and I love them. Don’t be scared of glitter, there are so many techniques out there that makes removing glitter so much easier. First up I have for you is Tammy. Tammy is packed full of various size and shapes of glitter. The colors blend very well together and look beautiful on their own or as an accent. I wore Tammy for a few days and it held up very well and I received a LOT of complements. I love the labels. They are so cute! Look at all that glitter! So so pretty in real life. I decided to go with a glitter gradient and used L’Oreal Penthouse Pink as the base. As you can see the polish blends well and the different sizes add a unique look. Next up is Jenny. Jenny is again packed with various size and shape glitters. This one had a very distinct blue color to it that I just loved. 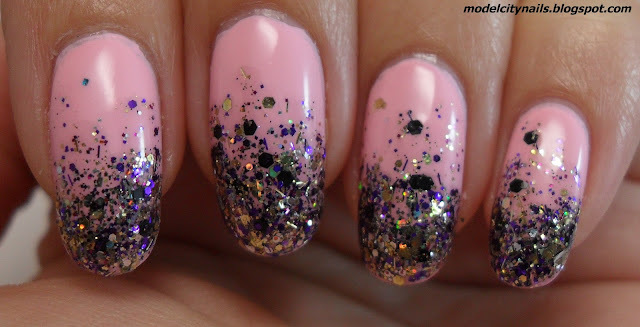 I used this one as a one coat glitter top coat and then also did an accent nail. The accent nail has no undies and is three coats. Great coverage and super easy to apply. Not chunky like most glitter bombs. Look at that, so beautiful! Again, great top coat or all on its own. After trying out Shimmer I must say. this stuff is great. Sometimes it is really hard to find a good glitter bomb that has so much to offer but both of these are spot on. I have my eye on a few more in the shop and may even contract her for a custom blend with my name on it. Shipping times are great, communication is top notch, and great products! You can’t go wrong with Shimmer. Thanks for stopping by this evening and be sure to enter the giveaway, only a few days left. She has soooo many pretty blends. I can’t wait to buy more! So pretty! Thank you. Wonderful pictures. I love your polish and will certainly be buying from you in the future.